New Zealand reverted to type following their record win in game one with a plucky yet ultimately futile effort in Auckland. The seven-wicket defeat was the sort of margin one would have expected from the two teams before a ball was bowled in the series. They had posted 158 – which looked below par given some of the high scores in the past at Eden Park – although they did well to get that many considering they were 50 for four with their faster scorers out. They were grateful to Colin de Grandhomme's half century and Ross Taylor's steadying 42. We would be surprised if they failed to make at least one change. Scott Kuggeleijn has not had the most productive of spells and Jimmy Neesham is a solid replacement. Blair Tickner, the Central Districts fast bowler, could be handed a debut. Victory was never in doubt for India after Rohit Sharma and Shikhar Dhawan found rhythm. 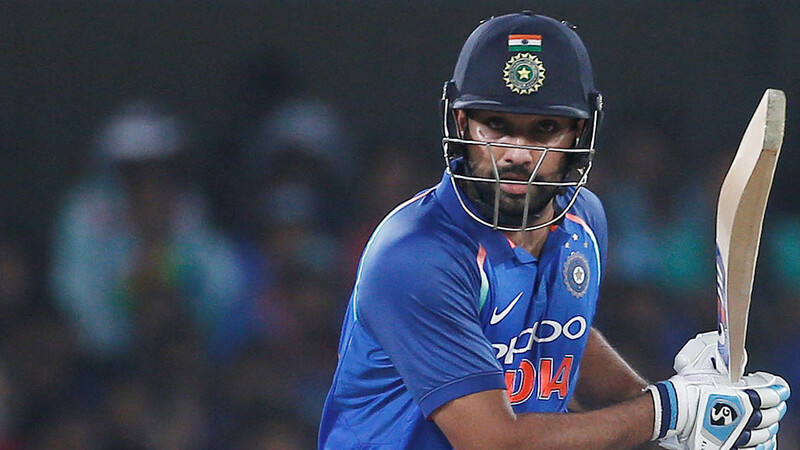 Rohit went into the record books as the highest T20 runscorer with a half-century and Dhawan was steady striking in the 90s. The hard work, however, had been done by Krunal Pandya, who picked up three wickets, and left-arm pacer Khaleel Ahmed who had been miserly up front and nibbled two out himself. With both finding form India may resist the temptation to reunite Bhuv Kumar and Sidd Kaul. Perhaps the best chance of Kaul getting a game were if Bhuvi to be rested. There will surely be switches in the batting line-up. Shubman Gill is due a go with Vijay Shankar not pulling up any trees. We also await the return of Kuldeep Yadav. Yuz Chahal was expensive in Auckland so it might be time for his fellow spinner to come back. There have been only two night matches at Hamilton. Both were won by the team batting first. New Zealand's 185 was far too much for Pakistan nine long years ago but last year England squeezed home by two runs after posting 194. This suggests conditions are pretty fair for the side chasing. Across all eight matches under lights at the venue it's a fifty-fifty split on toss bias. The eight first-innings suggest a corker of a batting wicket. They read (1-2 denote match won by side batting first or second, most recent first): 194-1/168-2/192-1/173-2/200-2/185-1/78/191-1. From those figures 190 looks necessary. India are [1.76] and New Zealand [2.28]. This should be a decent heat if the pitch reputation holds true. We could well see a big score being chased down and that will make for a fine trading event. It would be reasonable to reckon that we could see a flip-flop in favouritism were New Zealand, who blitzed brilliantly in the first match busting 200, to bat first with the likes of Tim Seifert and Colin Munro dangerous. To that end, India at the odds are a rather difficult sell. We wouldn't expect such slight odds if, say, they were going after 180. That would be the time to get with them particularly as they have shown to be nerveless chasers in the last two years. Munro tucked into England a year ago, smashing 57 off 21 balls. With such a start like that New Zealand should have won. They were 100 for one in the 12th. Munro is 13/5 for top Kiwi bat honours and Seifert 3s (both Sportsbook). For India, Rohit goes off at 13/5 with Dhawan 3s. Pant, who batted at No 3 last time, is 7/2. Gill is 11/2 and that looks value. Remember, money back if he doesn't play. With Hamilton such a freescoring ground due to its small size, the 19/2 that a century is scored with Sportsbook will attract interest. Someone like Rohit, for example, could do immense damage there. There have been no tons at the venue in the eight games but a plethora of 50s. Rohit is 5/6 to bust 23.5 with Sportsbook, by the way.